You must apply and receive admission to the Teacher Education Program in order to earn a teaching certificate in addition to your degree. Only upon admission to the Teacher Education Program will you be permitted to enroll in EDUC or READ course work at or above the 3000 level. Declaration of an academic major associated with teacher education is not equivalent to program admission. The Teacher Education Advisory Committee (TEAC) oversees the Program's application review and admission process. If admitted, you will be notified of your status via email. If you were not admitted to the Program, you may reapply once eligibility requirements have been met. The School of Human Development and Education's professional sequence provides a framework for understanding the fundamentals of the educational system. 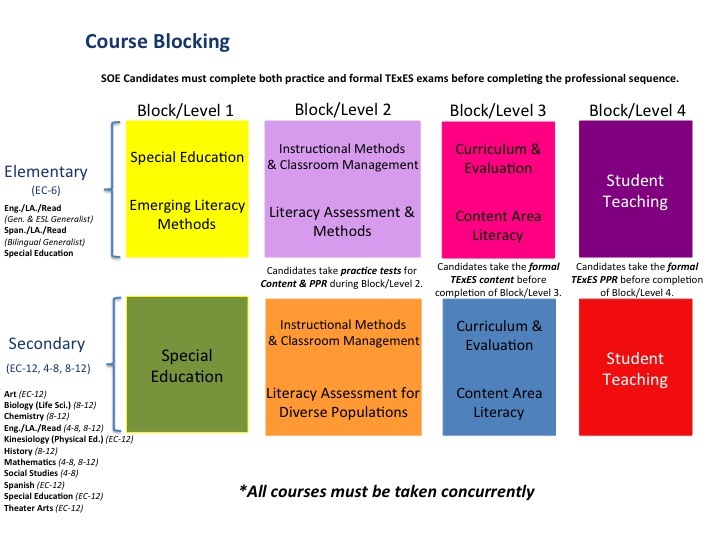 This framework is comprised of a series of individual courses, block courses, and in-field student teaching exercises. Teaching experiences in the field are conducted in a variety of settings including Austin community public, charter, private, and parochial schools, as directed by your instructor. The sequence culminates in a Student Teaching internship, designed to be a "capstone" experience. Student teaching allows you to put theories of curriculum and pedagogy into practice. The program is broken into two three-hour courses and is designed as a capstone experience. The intent is to ensure that the students recommended for teacher certification are able to effectively and independently carry out the responsibilities required for professional success. A comprehensive program overview including placement guidelines and standards and requirements can be found in the Student Teaching Handbook. Students who are enrolled in the Teacher Education Program and meet the Student Teacher Internship program requirements are encouraged to apply. Please email Field Education Supervisor, Fred Estrello (alfrede [at] stedwards.edu) with any questions or comments regarding the program. Students seeking teacher certification in Texas are required to successfully complete several licensure examinations. Your specific exam requirements will vary based on your designated degree or certification plan. Texas Examinations of Educator Standards (TExES) tests measure the content knowledge required of an entry-level educator in a particular field in Texas public schools. Bilingual Target Language Proficiency Test (BTLPT) tests your ability to write effective interpersonal and presentational discourse in a particular language. Practice tests are available to students preparing for teacher certification licensure examinations. For more information on the practice tests or to register for a practice test, contact the School of Education office at (512) 492-3197. The Texas Success Initiative (TSI) is a program which was developed by the 78th Texas State Legislature (and modified in 2013) under which all undergraduate students, who are not exempt, are required to take the TSI Assessment. The basic skills tested are reading, writing and mathematics. The writing component includes an essay. Students who fail a section of the TSI Assessment may be required to enroll in a developmental course(s) in that area. Currently, the TSI Assessment is available locally but is not offered at St. Edward's University. TSI Passing Score Levels Reading - 351 Mathematics 350 Writing: Writing score of at least 350 and an essay of at least 5; OR Writing Score of at least 363 and an essay of 4. ACT composite* score of 23 or higher, with individual math and/or English scores of no less than 19. ACT scores can be no more than five years old. (Meeting the composite and English scores will exempt students from both the reading and writing sections of TSI.) Students are responsible for taking the TSI Assessment in areas from which they are not exempt. SAT (taken prior to March 2016) combined* score of 1070 or higher, with at least 500 math and/or reading (former verbal section). SAT scores can be no more than five years old. Residual SAT cannot be used for TSI exemption. (Meeting the combined and reading scores will exempt students from both the reading and writing sections of TSI.) Students are responsible for taking the TSI Assessment in areas from which they are not exempt. SAT (taken March 2016 and after) – exemption includes a 480 or higher on the Evidenced-Based Reading and Writing and/or a 530 or higher on the Math section. (Scores no more than 5 years old.) Residual SAT cannot be used for exemption. Students must take the TSI Assessment for sections from which they are not exempt. * The writing components of the ACT and the SAT (prior to March 2016) tests are not currently used in determining TSI exemptions. Eleventh grade exit-level TAKS scores of 2200 or higher on math and/or 2200 or higher in English Language Arts with a writing composition rating of at least 3. TAKS scores can be no more than five years old*. (The exit-level TAKS is a test given in Texas Public High Schools since Spring 2004.) [Note: The English Language Arts and written composition sections must be met together -- if neither or only one area is met, student must take both the reading and writing sections of the TSI Assessment.] *Effective August 15, 2013: the Texas Higher Education Coordinating Board approved TAKS exemptions for scores no more than five years old. STAAR Algebra II, English III reading, and/or English III writing at the Final Recommended Level II performance standard. (For Algebra II, this is a score of at least 4000. For English III reading and writing, this is a score of at least 2000.) STAAR scores can be no more than five years old. Students are responsible for taking the TSI Assessment in areas from which they are not exempt. Students who have an associate or bachelor's degree earned from an accredited college or university. Military Service: Students who are serving in the state of Texas as active duty members of the Armed Forces of the United States are TSI exempt. Official documentation of active duty status for the enrollment period is required. Students must file a Verification of Active Duty form each semester which can be obtained in the Base Education Office. Students who are on active duty in the Texas National Guard are TSI exempt. A verification letter from the Unit Administrator, is required each semester. Students who are members of a reserve component of the armed forces for at least 3 years preceding enrollment are TSI exempt. A verification letter from the Unit Administrator, is required each semester. Students who on or after August 1, 1990, were honorably discharged, retired, or released from active duty as a member of the U.S. armed forces, Texas National Guard, or member of reserve component are TSI exempt. A copy of the DD214 form showing this status is required.